Seating: By lofting the beds, the students allowed enough room to bring in that comfy purple futon, which is decked out with two throw-pillows. The two tables in front of the futon are small and light, making them versatile to move around. Decor: The white walls are anything but fussy, adorned only by a pretty floral picture. 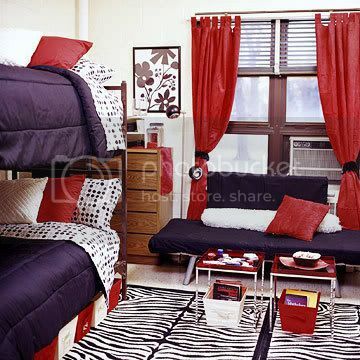 And if anything can help transform a dorm into a more cozy space, it's the window treatments. Those red ones can be tied back to let the sunshine in, or pulled shut for privacy. I also like the red table runner that is on the dressers and the nearby modern floor lamp. 1. Butterfly and Gerbera art print from artistscs28 on Etsy. 2. Dwell Polka Dot Sheet Set from Target. 3. Klubbo Nesting Tables from Ikea. 4. Red Dvala Duvet Cover from Ikea. 5. Black Storage Tote from Target. 6. White Storage Tote from Target. 7. Hand Tufted Zebra Rug from Target. 8. Your Zone Purple Curtains from Walmart. 9. Purple Decorative Pillow from Target. 10. Splendor Crinkle Rabbit Pillows from Target. 11. Domino Arc Floor Lamp from Bed Bath & Beyond. 12. Mali Red and White Flex Futon from Target. 13. Purple Table Runner from Cuvee Kitchen Apparel. 14. Dahlia Garden art print from artistscs28 on Etsy. Excellent ideas here! I really like the different styles and color themes. Thanks!